Sorry for the brief hiatus I took from my trip report! I took a week or two off while I celebrated turning 30! In fact, my sister and I will be at Walt Disney World next week to celebrate together! If you're not already following me on Twitter, I encourage you to click on the link to the right to do so. I'll be posting photos and updates throughout the trip. 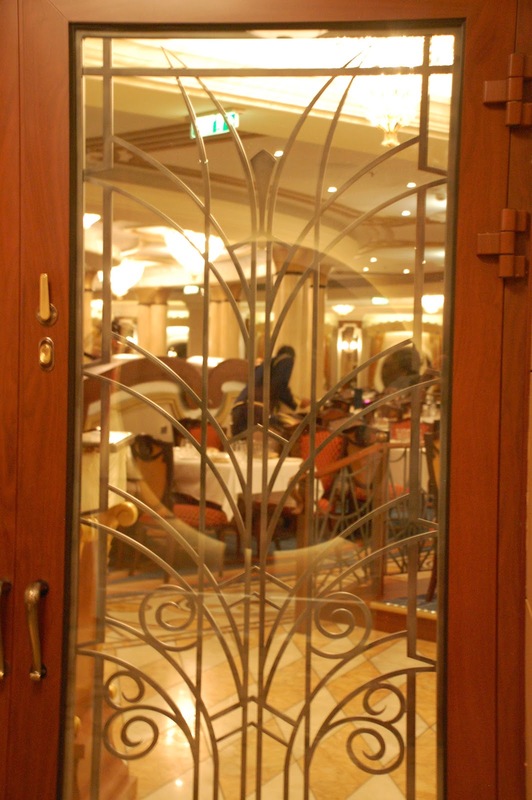 Now let's get back aboard the Disney Dream, shall we? When last we "spoke" my parents and I had gone to explore the Pink Lounge and were headed towards the Royal Palace for dinner. Along the hallway, we saw some of my favorite art on board. It's simple sketches of various characters. I love this style! If you arrive early to dinner, you wait in the hallway outside until the doors open. There were two entrances to the Royal Palace. Mom & Dad waiting in one of the giant "portholes"
Dinner this evening was good but not my favorite, but I loved the chandeliers (like always). Without further ado, I'll get to the food photos and descriptions. My mother's appetizer was the Double Baked Spinach and Cheese Soufflé. It looked different than I expected. also loved the design of it! Just a little more magic for the table! The olive spread was not my favorite, so they kindly brought me butter. Josh will love using them when they visit GA this summer! Most of us got the Iced Lobster and Jumbo Shrimp appetizer. It was one of my favorites of the entire trip. Every simple but delicious. I loved how they put the cocktail sauce on my plate as a Mickey head. like a wet rag on top of the soup. Ew. Mom had The Comtesse du Barry's Soup which was a cauliflower cream soup. This is the Aged Angus Grilled Beef Tenderloin topped with Grilled Shrimp. like the steak from the Enchanted Garden the night before. Our server, Niks, was always good about making suggestions and helping us decide what to order. The night before he told us the Double Cut Rack of Lamb with a Dijon Crust was his favorite. My brother-in-law ordered it and mentioned that he wasn't a big fan of lamb, but he was willing to try it if Niks said it was so good. Niks steered him away from it saying he'd be happier with another choice. I appreciated that honesty. During dessert time, Randy took the kids out to start meeting some of the characters that were out in the atrium. While there are lines to see nightly and daily characters, they're nothing like at Walt Disney World, AND the characters were in their pirate finery! I don't have photos of dessert because Randy took the camera. In my mind though, the character photos were 20x better than the dessert this night. I couldn't decide, so I took the Disney Food Blog's advice and ordered two. This seemed to confuse Niks a bit... but he brought both. Haha! No idea why he was so confused. Josh not wanting to wear his...) with Captain Mickey. They spotted Pirate Stitch and took a pic for me since I love Stitch! After dinner and characters, there was a Pirate Night party on the pool deck and then fireworks at sea. Mom and Dad took the kids, so LaRae, Randy, and I could have some adult time. I tried to hang back a bit and be their photographer. us were guilty of this. Hehe. to take off the sweatshirt even for photos. I regret that a tiny bit. The elevators had such old-fashioned glamour! sweet all dressed up and walking hand in hand down the corridor. The moon was large and beautiful slightly behind some clouds. Next trip I shall bring a tripod, so I can do longer exposure on fireworks. After the fireworks, we were all exhausted, so we went back to the room for bed. Have I shown you this great little guy that we found on my bed? I love when they snag thing like sunglasses to use on the towel animals. All the towel animals were unbelievable! I so wanted to bring him home with me! Thursday come back to join my family and I on Disney's private island: Castaway Cay! im normally a disneyworld type of guy, but being swayed over to one of their cruises now!